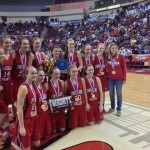 Cumberland Valley defeated Spring-Ford 49-30 on Friday, March 21, to win the PIAA Class AAAA Girls Basketball Championship. It was CV’s second girls’ state basketball title and its first since a 54-44 win over Oakland Catholic in 2002. The Eagles had lost to Spring-Ford last year, 60-45. CV head coach Bill Wolf has now won titles at two different schools, having won at Central Dauphin in 2008. Two PIAA District III schools will play for state basketball championships this weekend at Giant Center. The Susquehanna Twp. boys will shoot for the PIAA Class AAA Boys Basketball Championships while the Cumberland Valley girl will play for the PIAA Class AAAA Girls Basketball Championship. Susquehanna Twp. (23-7), the District III champion, will meet perennial finalist Saints of Neumann-Goretti (26-4), the District XII champion, at 8 p.m. on Friday at Giant Center. Neumann-Goretti won three straight PIAA Class AAA boys’ titles in 2010, 2011 and 2012 before yielding to Imhotep Charter in 2013. Susquehanna Twp. defeated Imhotep in the opening round of the PIAA playoffs, 65-47, on March 7. The Indians have followed up that Imhotep victory with triumphs over Pottsville (52-45), Lancaster Mennonite (75-57) and Chartiers Valley (42-31). Susquehanna Twp. will be seeking its first state boys’ basketball championships since 1997 when it defeated Lewistown 64-45 in the Class AAA Boys championship game. The Indians also won the 1980 Class AA Boys championship. Neumann-Goretti has defeated Berks Catholic (62-46), Wilkes-Barre Grand Army of the Republic [GAR] (73-55), Allentown Central Catholic (60-50) and Philadelphia Electric (65-53). Cumberland Valley (27-5), the District III third-place team in Class AAAA girls, will meet District 1 runner-up Spring-Ford (27-6) for the second straight year in the PIAA championship game. The Eagles will play Spring-Ford on Friday at 6 pm at Giant Center. 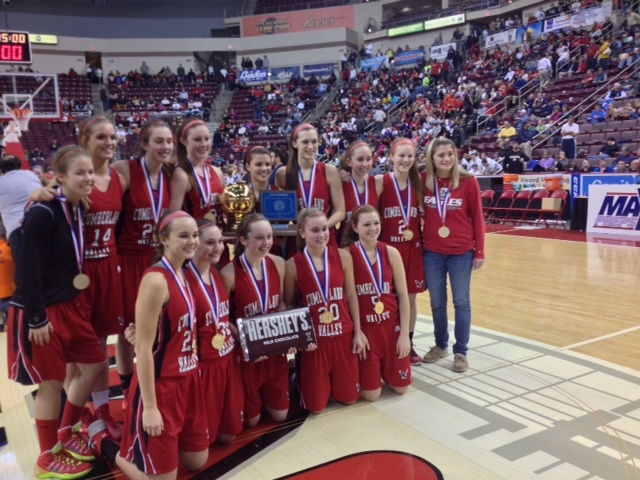 Spring-Ford defeated Cumberland Valley 60-45 in last year’s championship game. Cumberland Valley has defeated Central Bucks West (46-43), Archbishop Carroll (34-28), Dover (45-36) and West Chester’s Bayard Rustin (61-45) to reach the championship game. Spring-Ford beat Red Lion (51-45), Mechanicsburg (42-35), Abington (50-40) and North Allegheny (47-32) to reach the finals. District 3 swimmers enjoyed an excellent meet at the 2013-2014 PIAA Swimming and Diving Championships at Bucknell University, collecting 14 gold medals. On the meet’s fourth and final day, District 3 won just one gold medal, but it resulted in a spectacular record. West York freshman Courtney Harnish won the Class AA Girls 500 freestyle in 4:40.04, breaking the former record of 4:43.93 by Ambridge’s Lindsay Vrooman by nearly 4 seconds. It was Harnish’s second gold medal and second PIAA record; she won the Class AA Girls 200 freestyle the previous day in a time of 1:45.91. District 3 won five Class AA gold medals overall. Trinity sophomore Bradley Buchter won his second straight PIAA Class AA Boys 1-meter diving championship with a score of 557.30. That surpassed the PIAA record he set last year as a freshman at 533.05. The Trinity boys 200 medley relay team also won gold in 1:36.99. Ian DiCarlo, Henry Tanguay, Anthony Capper and Lucas Haywood comprised the championship team. As noted above, West York freshman Courtney Harnish set a PIAA record in the Class AA Girls 200 freestyle with a time of 1:45.91. Rebecca Luft of Northern York won her school’s first PIAA swimming championship with a 54.91 in the Class AA girls 100 butterfly. In Class AAA, Hershey capped a outstanding meet by winning 4 of the five Class AAA girls events in the pool while Cumberland Valley’s Sabrina Mortell won the Class AAA girls 500 freestyle in 4:52.55 to make it a District 3 sweep. Hershey’s Meaghan Raab ended her spectacular career with a pair of state records. Raab won the Class AAA girls 100 backstroke in 53.08, then swam the anchor leg on the 400 freestyle team that finished in 3:21.34. Kaley Buchanan, Vivi Tafuto and Madelyn Veith swam the first three legs of the 400 FR. Veith and Tafuto also won open even golds on Thusday. Veith won the Class AAA girls 100 freestyle in 50.45 while Tafuto won the 100 breaststroke in 1:01.81. On the meetsopn’ ieng day, Raab won the Class AAA girls 200 IM in record time (1:57.13) and led off the winning 200 medley relay followed by Tafuto, Gabi Broschard and Collette Robinson, which set a record in 1:42.09. Veith won the Class AAA girls 50 freestyle (23.13) while Northeastern’s Niki Price won her second straight Class AAA girls 100 butterfly (54.61). Hershey’s 8 champions in one meet is a PIAA girls record. Cumberland Valley and Boiling Springs won District 3 M&T Bank Team Wrestling Championships in their respective classes on Saturday at Milton Hershey’s Spartan Center. Cumberland Valley defeated Central Dauphin 39-24 to win its 7th District 3-AAA Team Wrestling Championship and ended Central Dauphin’s run of consecutive titles at 6. Both schools now have seven District 3-AAA dual meet championships, the most among Class AAA schools. Boiling Springs won its fourth straight District 3-AA championship with a 47-15 triumph over Hamburg. The Bubblers have won six Class AA titles, one fewer than Hanover. The old list serv used to communicate with the District III Committee and other District III athletic directors is kaput. Fortunately, the district was just preparing to roll out the new list serv. Under the current circumstance, we are asking that all District III ADs who have not signed up for the new list serv please do so immediately. In order to maintain the integrity and the security of the system, please contact Rod Frisco directly at 717-919-5144 or email at tripletdad1@comcast.net for sign-up instructions. Please attend to this matter as soon as possible.